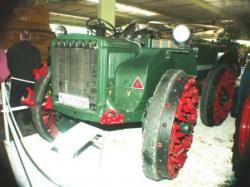 1 - 1937 Miag Tractor with MWM diesel 19 hp. It is the only remaining copy and restoration lasted 2 years. 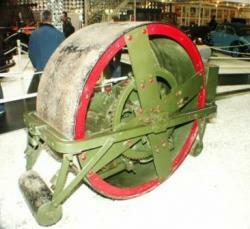 2 - Deutz sidewalk roller of dating from 1926. 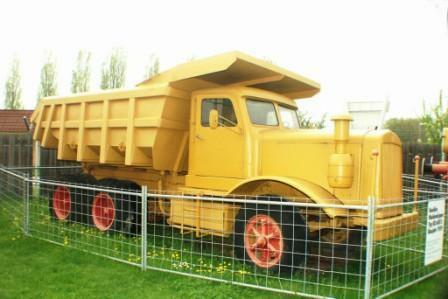 3 - This rigid dumper Mack of 1969, 8-cylinder engine of 850 hp, capacity of 27 m3, measuring 5 m wide and 4.5 m high was used for 18 years in the Bopp career. 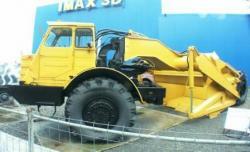 It weighs 35 tons for a gross weight of 55 T.
4 - One wheel Kemna EW type 15 small roll with diesel engine. It weighs 1.5 T and dates from 1940. 5 - Ruthemeyer steamroller of 1937 used by the Company Nickel & Steitz of Freiburg was equipped with a damper and could use coal or wood for heating. 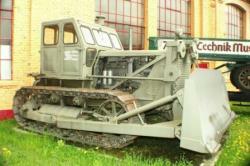 6 - Russian MAZ 546 P moto-scraper with 8 cylinder engine of 215 hp whose production began in 1973. 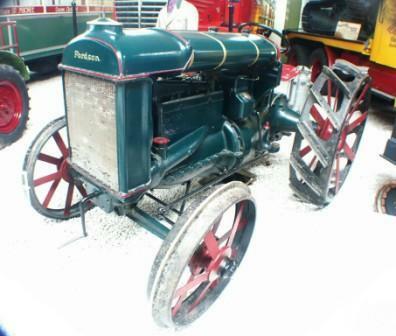 7 - Fordson (Ford & Son) Tractor model F of 27 hp and 4 cylinders ; it has the engine of the famous Model T Ford and a screw axel. 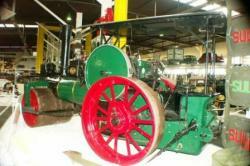 This affordability tractor was the first mass-manufactured in the United States and in England from 1917 to 1928 to 750 000 copies. 8 - Schmiedag small tractor of 0.8 T dating from 1965 but sold in 1954 with Fichtel & Sachs engine of 10 hp. An electric version was scheduled to work in enclosed buildings. The Schmiedag firm still exists and is part of the Georg group. 9 - Aveling & Porter roller of 1905. Weighing 16 tons, it developed 130 hp with 1 cylinder. 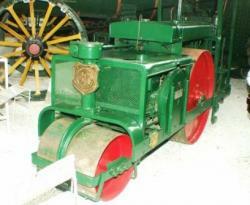 The rolls were used since 1885 and were the first construction mechanical machines. 10 - Stalin tractor built in 1950. 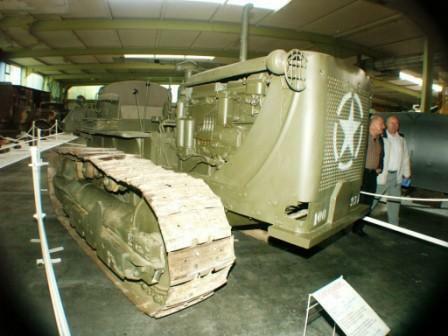 Soviet Union built the Caterpillar D7 during the Second World War used as standard artillery tractors. This achievement after war was used in construction. 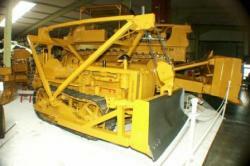 11 - Kaeble type KD 680 E dumper year 1959, 8-cylinder engine of 240 hp with a capacity of 19 m3. 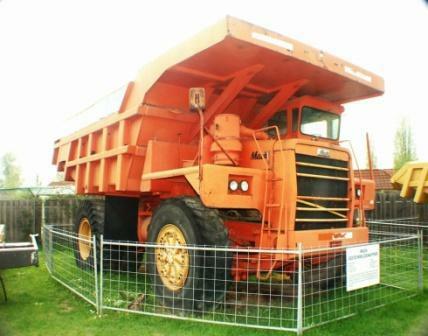 Total weight of 38 t including 16 useful. 12 - Caterpillar D4 bulldozer of 1940. A small motor launch by hands started the whole. Used by the U.S. Engineers during the war, he served as a civilian until the early 80s, but starts with a battery. It was built among other by Russia under license. 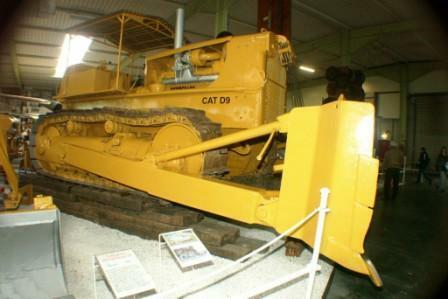 13 - Caterpillar D9 bulldozer, 1956, weighing 26 tonnes, with 4-cylinder engine with 236 hp. 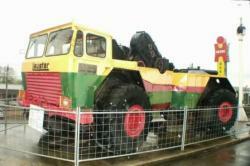 Introduced in 1954, it was the largest tractor in the world. He was replaced by the D353 turbo-engine with conventional transmission or torque converter. 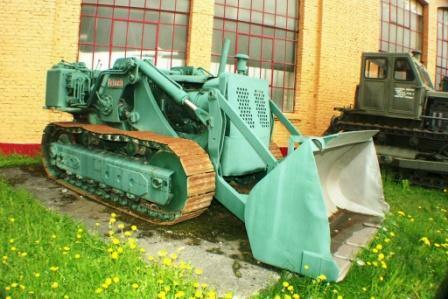 14 - The Caterpillar D7 tractor from 1941 still in running condition, 4 cylinder diesel engine 80 hp has been used by the U.S Corps of Engineers and post-war for reconstruction in West Germany. These models are still used in Africa today. 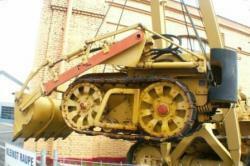 15 - Pavesi articulated tractor dating from 1937 found in a Spanish arsenal in 1960. 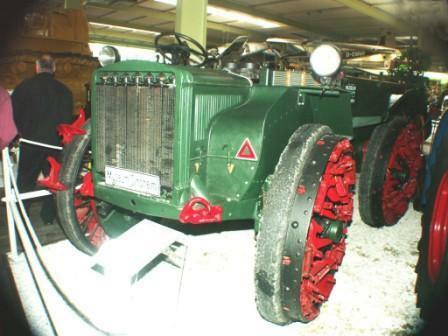 In 1913, Pavesi & Tolotti of Milan dreamed up in building for agriculture the first all-terrain articulated equal 4-wheel drive tractors. 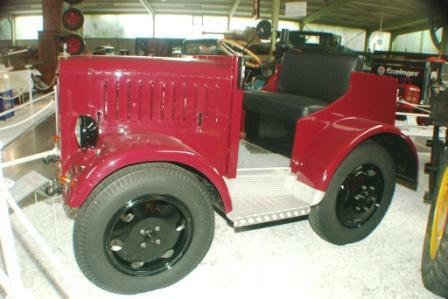 In 1925 appeared the solid tires on P4 model. They were manufactured under license in Sweden and England. 16 - This Frisch tracked loader of the 50s was used for reconstruction. Its strength was such that he was still working in the late 80s. 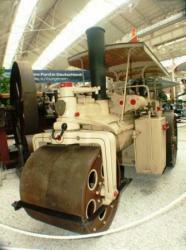 17 - Theodor Ohl steamroller, 1926. He worked long in different places and still rides on its own in rallies organized by the museum. 18 and 19 - Lauster tractor year 1969 could be a nice dumper. In fact, it is a prototype of articulated tractor and wrecker for Leopard 1 tank, whose particularity consists of a ribbed cylinder between front and rear wheels may come into contact with the ground to increase traction on bad land. Leopard 2 tank did not need this wrecker so the project was dropped. 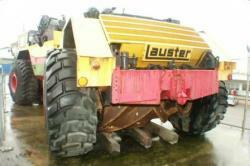 18 and 19 - Lauster tractor year 1969. Museums of Sinsheim and Speyer are located in South Manheim, Germany, 140 km from Strasbourg. 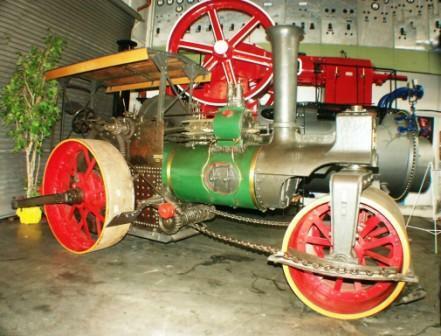 These two museums, indivisible, created respectively in 1981 and 1991 exhibit mainly locomotion machinery, whether on land, air or water and even underwater. They have combined for 20 ha including 5 covered. It is absolutely an awesome experience to visit on these two sites only 40 km distant as for old and rare models. Exposed 120 aircraft (including an Antonov AN-22, a Concorde, a TU 144 and a Boeing 747 "Jumbo Jet") and 70 helicopters, 350 vintage cars (including collections of American Fifties, Mercedes and Maybach) 40 fire fighting vehicles, 200 motorcycles, 40 Formula 1 and sports cars, 47 locomotives, 1 boat 34 m long dry dock, and even submarines, besides a naval museum and another for scaled models. They can also see impressive power generators and marine engines. These museums are claiming 1.7 million visitors a year. Mechanical organs are many and varied, scattered in all corners of museums, allow a visit to period music among different models. 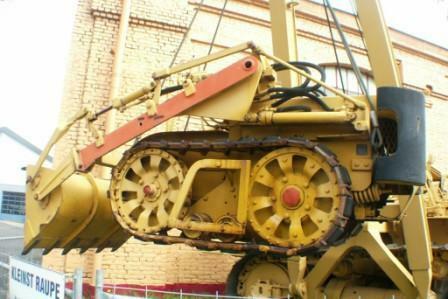 Regarding construction equipment, they can see a lot of very old steam rollers and locomobiles, dozers, dumpers, loaders, scrapers, tractors and other industrial vehicles whose pictures show one aspect. For those interested by general mechanics and vehicles in particular, they must visit these museums. Two words are needed then : gigantism and diversity. That vehicle was a functional model/demonstrator of the LAUSTER AXLE (FML= Funktionsmodell LAUSTER Achse). Designed for working as a tractor (Zugmaschine) and wrecker for the German Leopard I tank. So it was everything else than a dumper. It fullfilled it´s objectives by exceeding all the specifications. More than 40 pieces of LAUSTER LT40 where discussed to be ordered. The LT40 had a weight of about 40 tons and was capable to wreck two Leopard 1 tanks with blocked chains and even reverse running chains (traction force of more than 530 kN). The propulsion system was Diesel Electric (Serial Hybrid drive) with a total of 630 bhp with stepless traction control without gear shift (Sub-supplier of LAUSTER for the power electric parts was the SIEMENS Locomotive segment). The next generaton of propulsion system with intense oil cooled DC motors was already developped in collaboration with the university of Stuttgart. The reason for not further developping the LT40 was the next generation of German combat vehicles: the Leopard II was planned to be not in need of such wrecker vehicle due to improved off road capabilities.